I’ve been thinking a lot this week about a slower pace of life. You’d think that being a yoga & mindfulness teacher with some energy therapy and contentment coaching thrown in, I’d have that pretty much sussed. 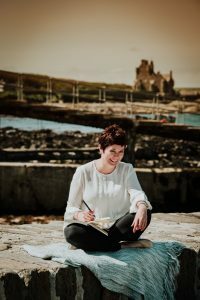 In fact, the biggest danger of loving my job so much, is that I take on lots of new projects and clients and forget how much I also love to take a bit of time to slow down. For a long time I believed that if I wasn’t busy all the time then I wasn’t successful or secure. Sometimes I still believe that. Everything I have learned from developing Vitality has shown me that the opposite is in fact true and slow paced living is what makes for a happy and contented life. Do you find that the more you have to do, the faster time goes? I try to be organised and schedule in development time and creative time but I have to be honest, once I start feeling overwhelmed there is a strong temptation to disappear into social media oblivion. In my slow paced life, I take time out, I take the dogs for a walk, I lie on the floor with them and we talk to each other in blinks and sniffs (am I the only one? G is pretty sure I am .. lol), I sit with a cup of coffee and drink the whole cup! And then, I go back to whatever it was I was telling myself was so important … or I don’t. Read, write, paint, knit, sew, upcycle ..
We are all creative. All of us. Doing some kind of creative activity every day is soooo nourishing, especially when we’re feeling time poor. It doesn’t matter whether it’s good .. it just matters that we take the time. 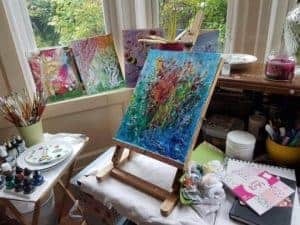 I have my ‘making things desk’ set out in my living room with all my paints out waiting so that I can grab five minutes to splash paint about or glue paper to things any time I want. I don’t care if its good. I’m a big fan of finger painting at the moment. Think back to when you were really,really small and everything you created was a masterpiece. You were right! I also write. I absolutely love to write but I care a little bit more whether its good (I’m trying to care less) so I use painting to get me tuned into the slower pace and then go play with my writing. Reading .. I’m creating in my imagination, so it still counts? Right? My absolute slow living indulgence is to spend a whole day on the couch (preferably in PJs) with the fire on, a great book and endless cups of herbal tea. ‘Candy books’ are my favourite for this. Books where you know its all going to end well, everybody is lovely except that one person you know you’re meant to hate and there’s a wee bit of conflict to keep you going. Nora Roberts is my candy book favourite. Don’t get me wrong, I love literature, I love well written complicated books that challenge me and make me wish I’d written them … but for my slow paced day of luxury, its candy books all the way. Top Tip: Keep your creative stuff handy .. if you have to haul everything out and tidy it away every time, you won’t do it. It can just be a colouring book and some pens but make it easy and you’ll be much more likely to grab a little slow paced time. As a fully signed up introvert I am the world’s worst for making plans with other people and cancelling to stay home in my PJs with a book. I love people, I honestly do, but I find socialising overwhelming. In my slow paced life I take time to see my friends and family on a one to one or small group basis. If that socialising includes PJs and a Netflix boxset then these are definitely my kind of people! I am a little bit envious of extroverts, with their ability to chat to everyone and recharge in the company of people … my partner and many of my closest friends are extroverts … but I prefer to let them socialise for me and stay home with my book … living sloooooowly .. loving life <3 Luckily my daughter is an introvert too,so we love box sets, blankets, cosy chats and time to just be together and do much of nothing. Top Tip: Combine one of your favourite slow paced life activities with some (or one) of your favourite people. Top Tip: Definitely buy a slow cooker and a slower cooker cookbook. I am a huge fan of slow paced exercise – our yoga classes are slow vinyasa flow and yin classes .. yin is soooo slow you could have a nap during a posture … bliss bliss bliss. 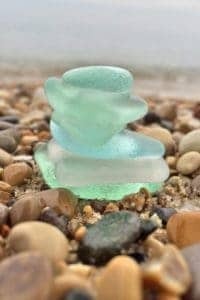 I love to walk on the beach and collect sea glass. I like to walk for the sake of walking, look at the things around me, play with the dogs, chat to other dog walkers. I adore pilates and have found a wonderful class where it is such a luxury to be taught rather than teach. I’ve run in the past and I’ve done all kinds of exercise classes but for me, slow paced works best with my life. I find that having a morning and evening routine makes a big difference to how I feel about my day. Taking my time in the morning carries that mood into the rest of the day and slowing down in the evening helps me sleep better. My morning routine starts quite early with many kisses from Daisy (the pug) – I like to get up at least 3 hours before my first client (usually 10.30am) so that I can drink coffee, have breakfast, write my morning pages (more about these in another blog), meditate, read, walk the dogs and have a think about the day ahead. Sometimes this works brilliantly, sometimes its all about lots of coffee and a binge read of facebook. I can tell the difference! We run a Daily Self Care thread over on our Vitality facebook page – I find that helps with my morning routine. Maybe you’d like to join in? So, those are my tips for a slow paced life .. take the time to smell the coffee (or the dogs), make something, read something, binge on Netflix, have a stash of great PJs, have a routine and most importantly have space in your life to do nothing … absolutely nothing … those lying on the carpet, blinking at the dogs, knowing there’s nothing else I have to do or nowhere else I need to be moments are probably some of my happiest. Top Tip: The Miracle Morning is a great read if you’d like to develop a really powerful morning routine. Love this, we can’t make anything but we do have Pj stashes, Netflix and coffee!